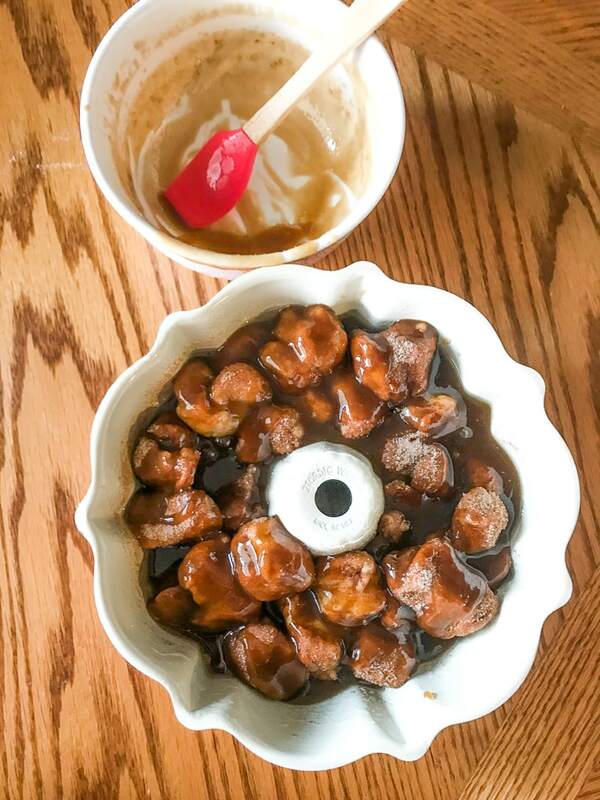 It won’t get any tastier than this Instant Pot Monkey Bread recipe. It is ooey and gooey like a cinnamon roll and drizzled with perfectly sweet vanilla icing. Ever since I share my instant pot cinnamon roll recipe with you a year ago, I have been wanting to branch out and try other ways to get the same flavors in the instant pot. I have finally found it! 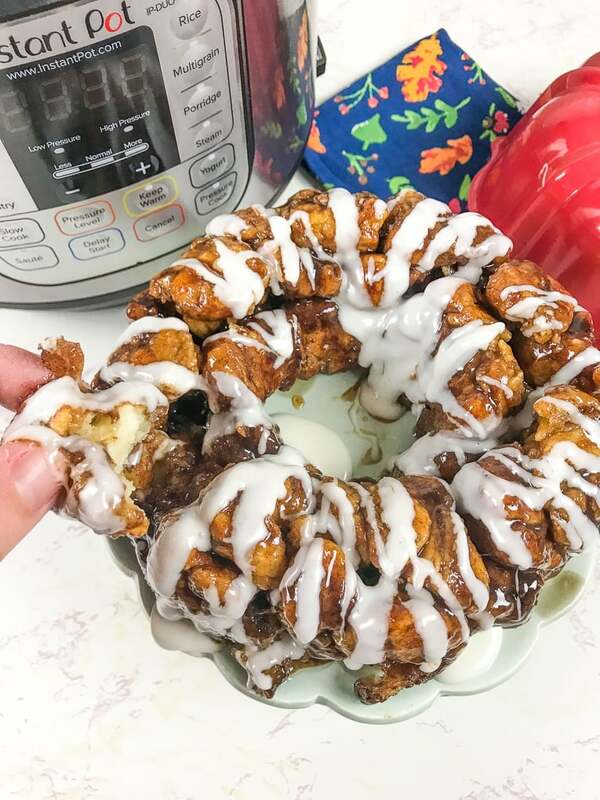 Instant pot monkey bread is like instant pot cinnamon rolls, but it’s even more fun. Monkey bread is a sweet pull-apart bread (kinda like this savory pull-apart pizza bread). It is made with biscuit dough cut into chunks and tossed in cinnamon sugar. After cooking, it is drizzled with a homemade vanilla icing (like the one used in these banana blueberry muffins). Monkey bread also goes by a whole bunch of other names, according to Wikipedia. It got the name Monkey Bread because it is a finger food that you pick apart like a Monkey would. Well, call me a monkey because I am totally on-board with sweet bread made in the Instant Pot. 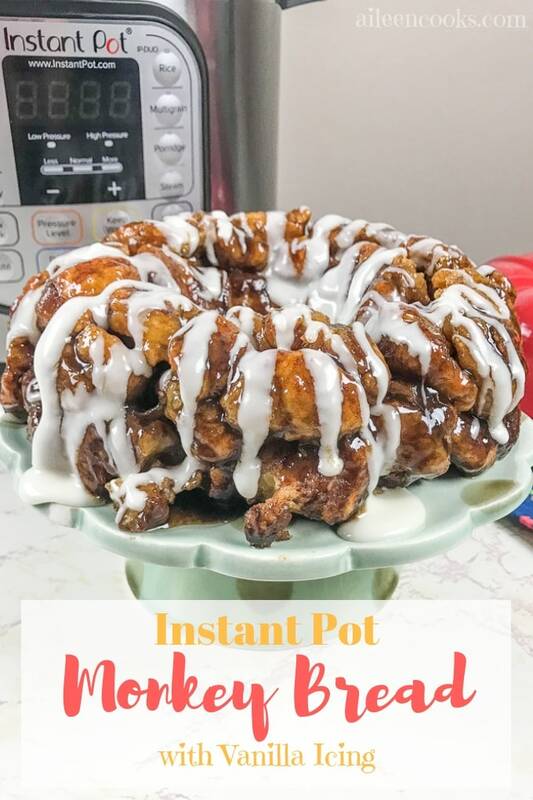 Why monkey bread in the instant pot? 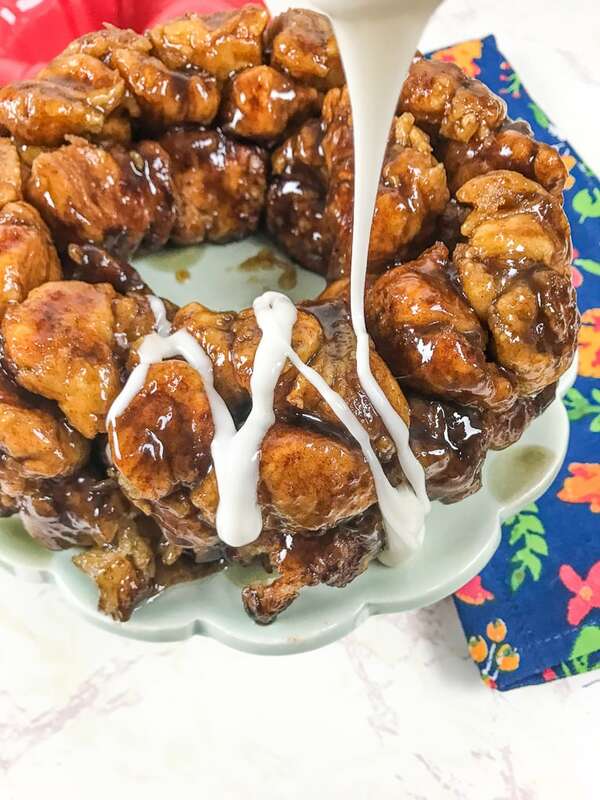 Instant Pot monkey bread is fun because you get to pull apart the monkey bread as you eat! 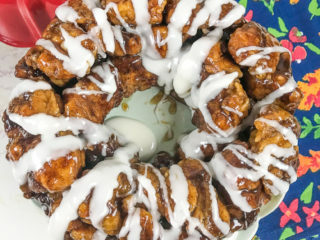 I love making monkey bread in the instant pot because the pressure cooking keeps the bread moist and the cinnamon sugar coating perfectly moist and gooey. 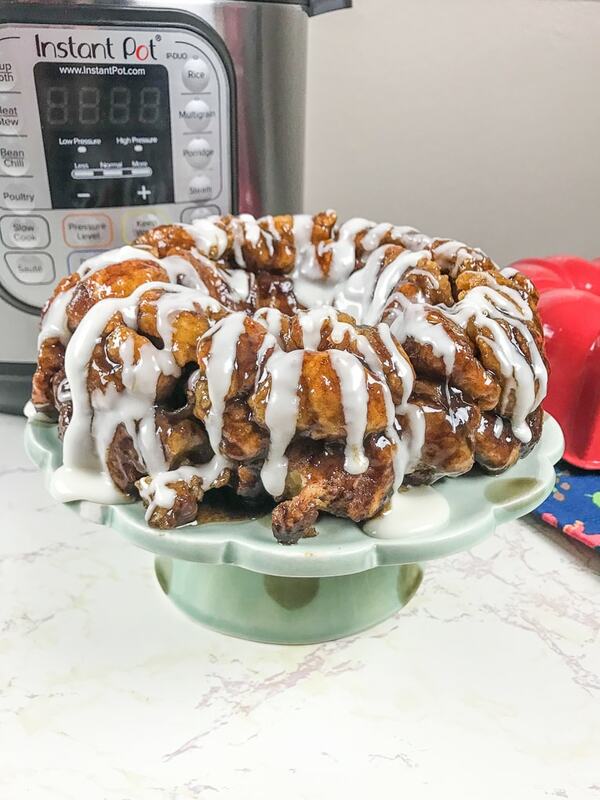 And just when you think it won’t get any better, the vanilla icing on top of the instant pot monkey bread makes a delicious breakfast/dessert amazing. It gives it that finishing touch that really makes me think of cinnamon rolls. Although, I think this recipe might be just a little bit easier. Or at least less intimidating. There are a few tricks to making really good monkey bread. The first is that you will need a bundt pan that fits into your Instant Pot. I have a 6 cup bundt pan I found on Amazon that works perfectly. 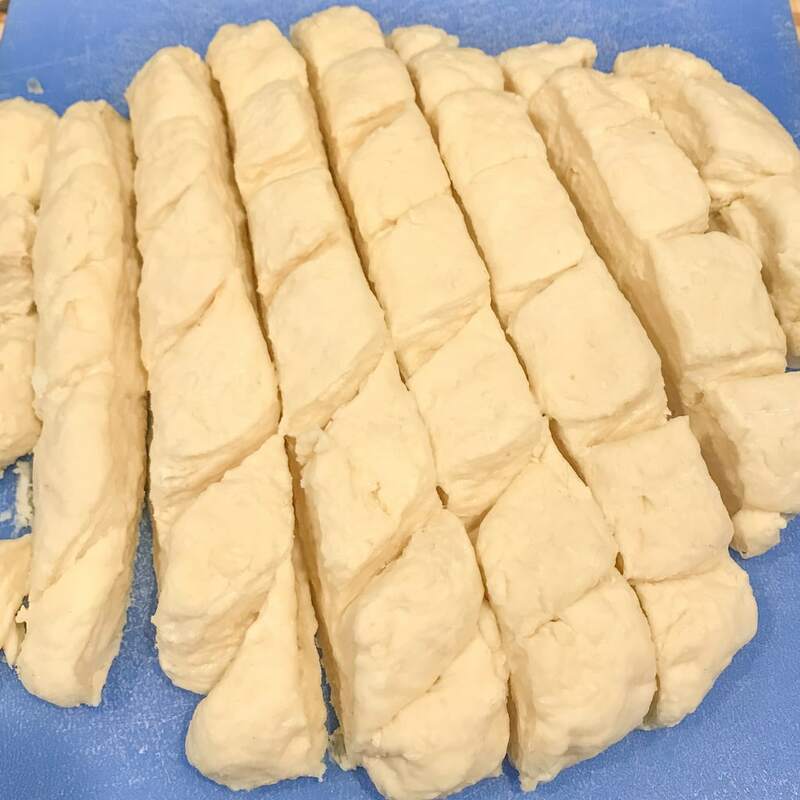 Cutting up the biscuit dough to make monkey bread can seem tricky, but it’s pretty easy. Check out this picture for a visual. As you can see, it does not need to be perfect. Just roughly 1-inch chunks. 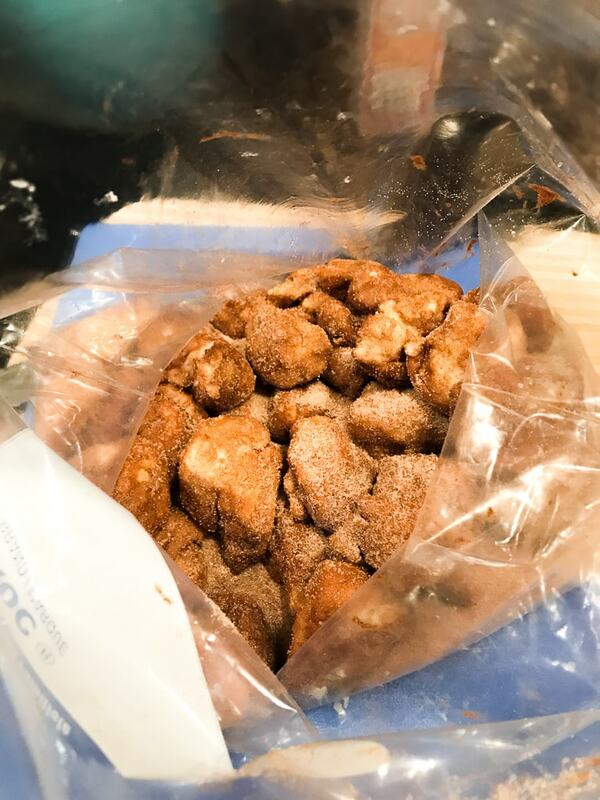 The next is using a gallon sized bag to get your monkey bread perfectly coated with cinnamon and sugar. I have found this works better than a bowl, but you can use a bowl to stir it up if you are in a pinch. If you don’t want to make your own biscuit dough for this recipe, you can skip that step and buy one of those cans of pre-made biscuit dough. Then you just cut it up as instructed in this recipe. Although, I think homemade is better. 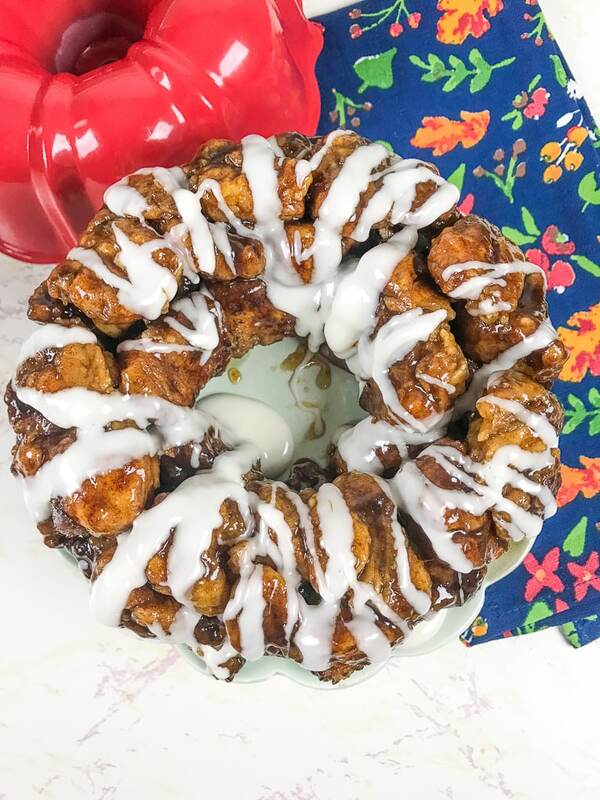 It won't get any tastier than this instant pot monkey bread recipe. It is ooey and gooey like a cinnamon roll and drizzled with perfectly sweet vanilla icing. Spray a (6-cup) bundt pan with cooking spray and set aside. Cut 1/2 cup butter into small cubes and pour into the dry ingredients. Use a fork to mix in the butter until the dry ingredients are crumbly and about the size of peas. Slowly pour in 1 cup milk, mixing until a dough forms. Use your hands to knead the dough about 10 minutes, until smooth. Pour the dough onto a lightly floured surface and pat into a 10 inch round. Cut the dough up into 1 inch pieces and set aside. Combine the granulated sugar and cinnamon in a gallon sized zip top bag. Close the bag and shake to mix. Pour the cut pieces of dough into the bag of cinnamon sugar. Gently knead the bag until each piece of dough is coated in cinnamon sugar. Remove the dough pieces and arrange them evenly in the bundt pan. Set the Instant Pot to Sauté. Pour in the brown sugar and remaining 1/2 cup butter. Whisk until the butter is melted and the brown sugar is dissolved, about 2 minutes. Turn off the Instant Pot. Pour the butter mixture over the top of the monkey bread pieces in the bundt pan. Remove the cooking pot and clean it. Put it back inside the Instant Pot. Add 1 1/2 cups water to the Instant Pot and place a trivet inside. Cover the bundt pan with a paper towel and aluminum foil, crimping the edges to discourage water from getting inside the pan. Create a foil sling and carefully lower the bundt pan into the Instant Pot. Close the lid and set the pressure release to sealing. Press the Manual or Pressure Cook button and adjust cook time to 21 minutes. Allow the pressure to release naturally for 5 minutes and then quick release the remaining pressure. Remove the bundt pan using the foil sling. Remove the foil and paper towel from the top of the pan and let cool on a rack for 5 minutes. While the monkey bread is cooling, whisk together the powder sugar and remaining 2 teaspoons milk in a small bowl. Set aside. Turn the bundt pan over onto a plate and wiggle the pan to allow the monkey bread to be released. Drizzle the monkey bread with the vanilla icing while it is still warm. Enjoy immediately and store any unused portion in an air-tight container at room temperature for up to 3 days. I love making sweet treats for my kids’ breakfasts on the weekends. 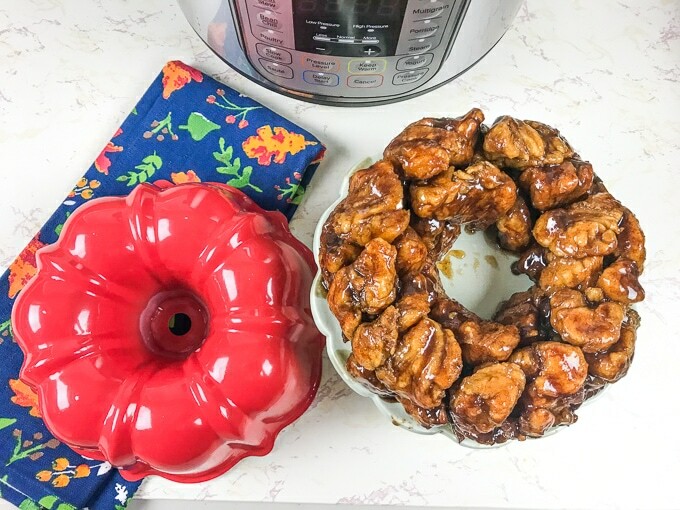 This instant pot monkey bread has definitely been added to the list! Can you prepare the dough the night before to bake fresh the next morning? Hi LeAnne. Yes, you can prepare the dough and refrigerate the night before. Just let it sit at room temperature for about 10 minutes prior to cooking. Does it have to be whole milk? Any milk variety will work.